I took these pictures on Monday evening when we got home from school and thought I'd share both my handbag AND my "school bag". PS - The cross body bag is by Urban Southern and you can check it out HERE. 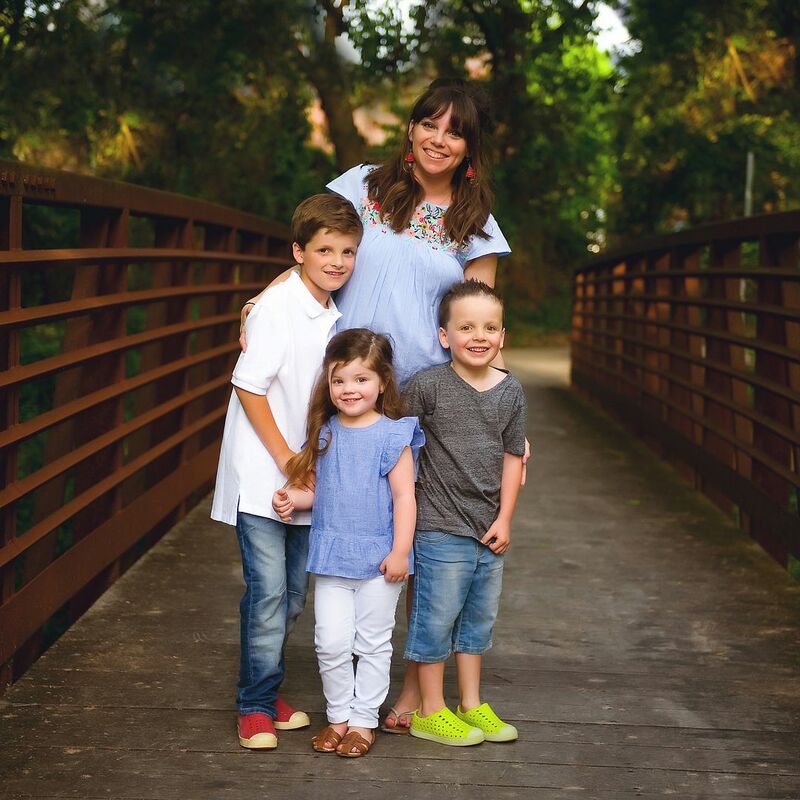 I reviewed it in this post and if you need one for yourself you can use the code MOM15! ... and then with my empty lunch box and cross body bag removed. Monday was BUSY and while most days I try really hard to not bring grading home.. other days (like Monday) it's just inevitable. I was running around like nuts and just threw everything in there. The mesh bag was what I carried with me to the TCU game a couple of weeks ago and it had a cell phone charger, tickets and some lip gloss in it. I needed to remember to bring it in the house from my van so I threw it in the big bag. ... and laptop and charger. 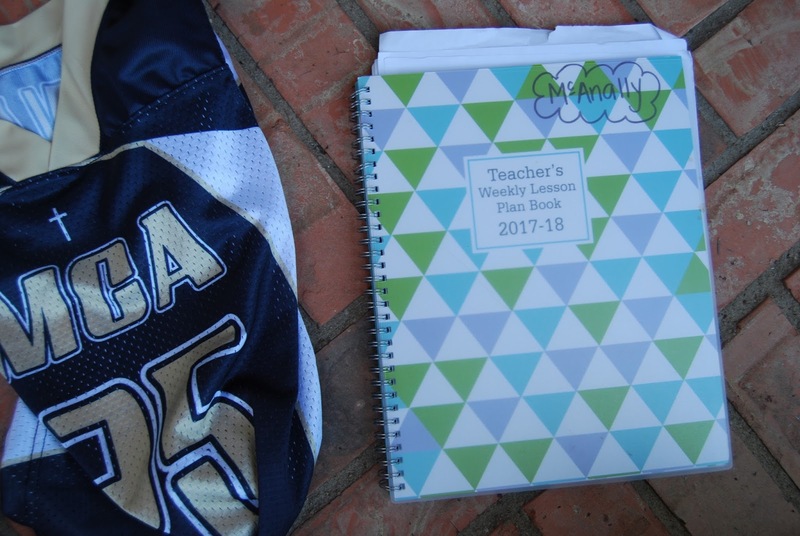 Mason's jersey (which I got at school that day since it wasn't in in time for his game last weekend) and my classroom planner. I've tried several planners for teaching and my FAVORITE by far is this one. It's inexpensive ($12 right now on Amazon!) and PERFECT for my schedule. A lot of teacher planners are designed for elementary teachers who have one class of kids all day long, with multiple preps a day this planner is what works best for me. It has tons of space for a quick lesson plan note, my weekly to-do-list and a space for kids schedule items that I need to have handy at school. It also has the monthly pages where I can plan out tests, quarter reports, etc. Told y'all I doodle :) Meetings, while on the phone, etc. I've always been a doodler. Still loving my cross body! I love that it's large enough to hold my "purse stuff", but small enough that I can toss it in my larger bag. And what's left in the bottom... z bar (LOVE! ), sunscreen, hair ties and gum. Sidenote - if you don't have a pop socket yet you NEED one! It literally "pops" out and helps you steady your phone without having to strain your pinky. It's great! I picked mine up on Amazon HERE. ... and this post with a bunny in my purse because duh. I'm excited to see all the things in y'alls bags! Link up below and show and tell us about what's in your bag! PS - This post contained affiliate links... thank you so much for supporting my blog! Whoa!! Andrea-your doodling is unlike any I've every seen! You know how much I love looking through your giant tote! Ha! It's always a fun little game for me ;) . Your doodling abilities are fantastic.....Totally having doodle envy overhere! I love my pop socket!! Watched my husband use his fr about a week before I had to order one, too. I feel so much more secure, as in I'm not going to drop it as often. Love getting a look at everyone's bags...and I heart that planner! Love the fall doodling. 😍 I keep meaning to get a pop socket, but I always seem to forget when I'm filling up my Amazon cart. Adding one right now! LOVE my pop socket. I'd go far as to say it's life changing! Your little doodles are so cute! What are your favorite doodle pens? (you know you should have just gone ahead and told us, right?😉) You really are so talented, Andrea!! Thanks for a fun prompt and hosting. You should try a Loopy! I had a popsocket that my students gave me for a long time and I love my Loopy even more. Instead of the pop out, its a loop that you can hold on to and steady yourself on with really pretty cases! I think I like looking in your planner more than the bags 😊 I'm weird like that! Oooh! This middle school math teacher who was not blessed w any artistic ability AT ALL 😉would love a shot of monthly planner each month! So pretty. Would make me happy just to open it. Maybe on Instagram? Pretty please?